I don’t know what it is you saw when you first looked at the photograph above. 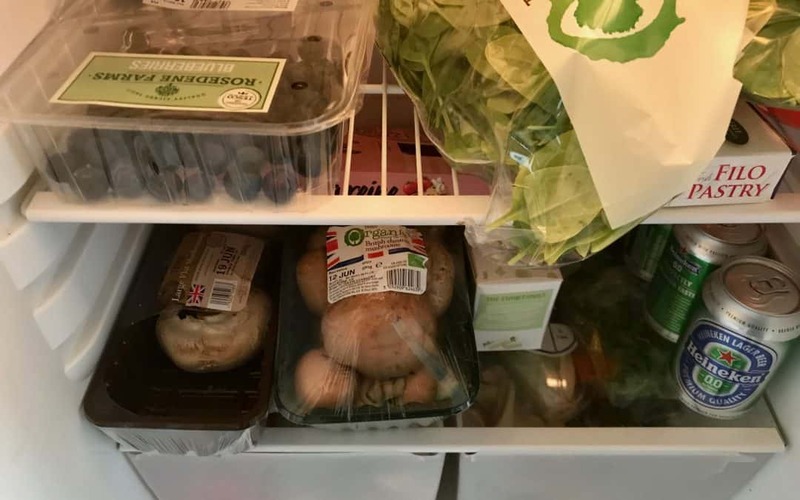 I opened the fridge door and was surprised to find a chicken on the bottom shelf that wasn’t there before. Where did it come from? Why hadn’t I noticed it before? What’s going on? I was confused. I picked it up only to discover that it’s not a chicken. It’s a punnet of mushrooms that just happen to be arranged in such a way that I immediately saw a chicken. The colour was right, the shape was right and so that is what I saw. But it’s not a chicken. They’re mushrooms. As soon as that door opened my brain set about providing me with information as to what was in there. It interpreted everything it saw and compared it to everything that ‘fitted’ with what it saw. And so I ‘saw’ a chicken and yet the label quite clearly states what it contains. This recognition immediately triggered me into asking a series of questions about the situation I was facing – why was there suddenly a chicken in the fridge? There shouldn’t be a chicken in the fridge because there wasn’t one earlier. I was in a trance – a very unique one at that moment. It didn’t last long – in fact only as long as it took me to pick it up and realise that I was holding was nothing more than mushrooms whose packed shape triggered me into believing that it was a chicken. I put it back, laughed at myself for believing that it could have been a chicken and then carried on my day. No harm done. We do this all the time (not specifically with chicken/mushrooms). We’re fantastic at it. I know I’m not the only person who has spotted a friend and either called or waved to them only to realise a split second later that it’s not your friend at all. Of course you’ve already waved or called. You didn’t think about it – you responded to the stimulus of your friend being there and then you realised the reality. Now what if you’re doing this in other contexts and situations? Somebody says something and you react in an unhelpful way because you’re responding to a ‘match’ you’ve made. Or something happens to trigger you at work – perhaps you’ve been given something to do that you ‘see’ as unfair and you’re immediately angry and feeling red in the face. You may even say something in response. And then it’s over and you’re wondering why you did what you did. Perhaps you’re embarrassed and apologetic. You tell yourself you’ll not act like that again and you don’t – until you match what’s happening again and the cycle continues. Often we don’t know why we are reacting to the situation in the way we are. But there is a reason – and it may have happened a long time ago and for a good reason. All behaviour has a positive intention, but that behaviour might not be serving you helpfully now. And what was once a specific response to a specific situation has now become more generalised and any situation that is ‘like’ that original one sets you off in the same way. It can be changed – by exploring what was the original events or circumstances in the past and reframing them you’ll be able to let go of that unhelpful reaction in the present. There are many ways a skilled therapist will be able to work with you to let go of those unhelpful triggers and associations. And who knows? You might even discover what comes first – the chicken or the.. mushroom. Change starts with a conversation so if you’re struggling to tell your mushrooms from a chicken then contact me to see how I can help.